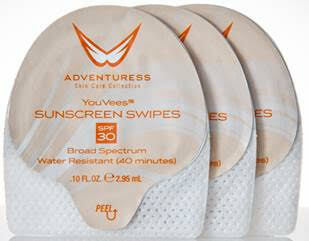 I have received these Skin care wipes form Adventuress for review. This packaging is a great idea for people who love to travel. In video below I show how ease they are to use. For a perfect match for your skin every time you swipe, try Adventuress Skincare Swipes, a new collection available in three best-selling products including on-the-go Cleanser Swipes, Moisturizer Swipes, and Sunscreen Swipes. In a proprietary, uniquely packaged sealed finger pocket, these individually wrapped swipes are easy to travel with and leave no mess, a perfect match for any Adventuress, anytime. So let's talk about each of these products. This creamy cleanser is one of the gentlest ways to cleanse skin of bacteria and dirt and will not strip skin’s natural fatty acids, leaving a luscious and hydrated feel. Ideal for sensitive, mature and dry skin. Fragrance, sulphate and paraben free, formulated with Coconut Alcohol, Camellia Japonica Seed Oil and Rosemary Leaf Oil. This powerful “bio-detox” formula works to keep skin well-hydrated and naturally balanced. An anti-aging cream, this moisturizer reduces the appearance of wrinkles as it soothes and contains properties to protect skin for oxidative stress and promotes collagen synthesis. With high levels of stabilized vitamin C, the moisturizer also prevents melanin synthesis and skin discoloration. Ideal for sensitive skin. Fragrance and paraben free, formulated with winter Rose Tsubaki oil, Chocolate Vine Akebia, stabilized vitamin C and Jojoba butter. These water-resistant swipes are designed with longevity and the utmost effectiveness in mind. A quality sunscreen that has the ability to stay on the skin and maintain effectiveness while under exposure to environmental elements. Using the synergistic UV screening properties of Titanium Dioxide and Octinoxate to help prevent sunscreen, this water-resistant sunscreen also contains silicone oils help maintain a solid hydrophobic barrier for 40 minutes while aloe and a blend of nourishing oils help moisturize and invigorate skin. This skin care collection would be great for travel. Having all three, to cleanse, moisturize, and protect your skin is the way to go. These are so easy to use, who wants to take full size bottles when they travel. Just throw them in your bag and your ready to go. Now for at home you can purchase full size products. I really enjoyed trying these products. If your always looking for new skin care collections, I would reccomend this line. Check out the Intro Offer Collection to try out. Here is some information on this intro collection. The Intro Offer Collection includes all of our best skin care products for women. This combination is perfect for use as your new skin care regime! All products are travel-size so you can bring them along where ever you go! The combination of the skin purifier and the moisturizer can reduce the appearance of wrinkles and lines as well as clean out clogged pores. If you plan on being outside, try our sunscreen as it not only keeps your skin safe from harmful UV rays, it also moisturizes! Give your skin a refreshing cleanse with our facial wipes. The complete package of travel friendly beauty products for keeping your skin looking and feeling healthy! Includes 1.7 oz. Cleanser, 1.0 Skin Purifier, 1.0 oz Moisturizer, 6 YouVee's Sunscreen Swipes and 6 Facial Wipes. **These were sent to me for free to review for everyone. I am not being paid to make this post or video. I am sharing with you my 100% honest opinion. I totally need these for my oil skin! Especially during the summer times! I know right? Me 2! I am always oily in the summer. I am very oily all year round. I do have to say i love how my skin felt afterwards. Most things i have tried dry my skin out. this one did not feel like it stripped my skin. it was gentle.